Breck senior forward David Roddy dribbled down the court, then dished a no-look pass to senior guard Joey Ganley to score a basket near the end of the first half. Later, Roddy dished a pass to sophomore Jaren Morton under the hoop. When the shot didn’t fall, Roddy was there for the rebound and dunk to open up a 12-point lead. Roddy led the way with 32 points as Breck, ranked No. 6 in Class 2A by Minnesota Basketball News, defeated Independent Metro Athletic Conference foe Providence Academy 67-44 Tuesday at Breck School. Sure, Roddy hit his shots and made free throws, but he also made key passes to his teammates, helped direct traffic and contributed solid defense. “He’s the ultimate teammate,” said Breck coach Brad Barber. “As I told other people, he could go get 40, 50 (points) a night. He doesn’t want to play that way. Ganley, who finished with 12 points, has played with Roddy for three seasons and agreed that Roddy, who’s committed to Colorado State and averages 29.5 points per game, is more than just a scorer. For his part, Roddy said he loves getting his teammates involved and has ever since he played as a little kid. “I love to see them succeed as well as me,” Roddy said. The team effort Roddy also mentioned was certainly evident for the Mustangs (16-3, 6-1), especially in the second half when they put up 43 points after a slow-starting first half. The scoring got off to a slow start on both sides in what was a tight game right away. It was about four minutes into the game before Breck scored its first basket, a tip from Roddy underneath. The Lions (12-6, 5-2) didn’t register a basket until more than seven minutes had elapsed. Barber attributed the uptight play in the first half to the stage of a big rivalry game and his players knowing they had already lost once to the Lions this season. Neither team led by more than four points in the first half, with the defenses keeping things close. But it was Breck that went on an 8-1 run to get the 24-21 edge at halftime. The momentum carried over into the second half in a big way, and the Mustangs settled down and got plenty of points in transition. The Mustangs opened up that 40-28 lead on Roddy’s dunk, and the lead kept building. It was part of a 15-0 run they used to take control. Of course, the offense was a byproduct of play at the other end. The Mustangs started getting steals, deflections and defensive rebounds, Roddy said. 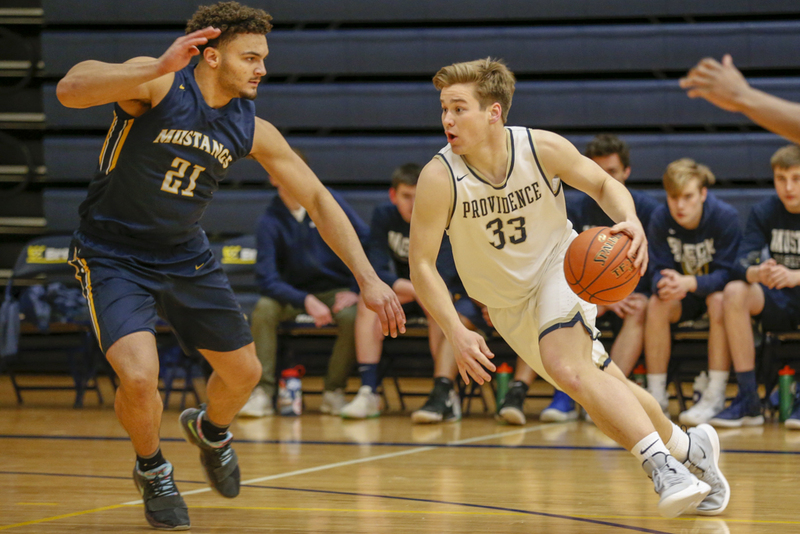 They held Providence Academy senior Mark Richelsen to just six points after he put up 28 against Breck in mid-January and came into Tuesday averaging 18.4 points per game. On Tuesday, it was Dylan Servais who led the Lions with 17 points, the only player on his team to reach double digits. With the win, the Mustangs evened their season series against Providence Academy, which beat Breck 56-47 on Jan. 18. This rematch was a game the Mustangs had circled on the calendar, according to Barber. 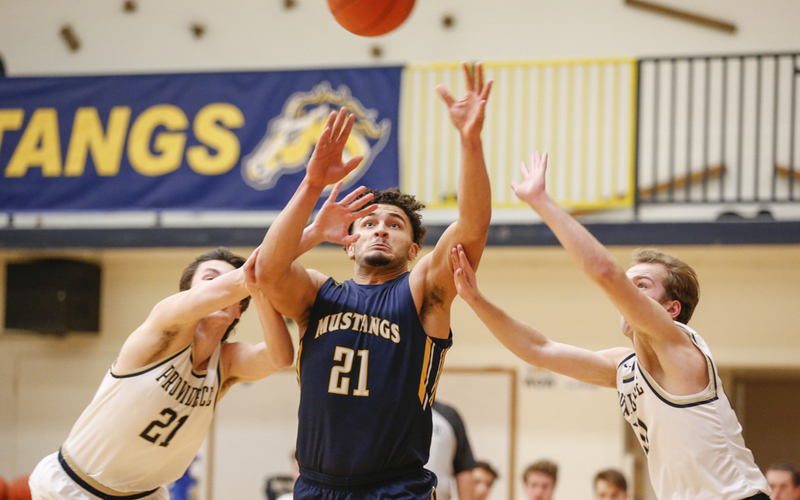 The Mustangs had a seven-point lead at halftime in the previous meeting but saw it slip away in the second half. “They knew it was one that they let slip away,” Barber said. Breck has won six straight and 12 of its last 13 games. The Mustangs also broke a tie with the Lions for the lead in the IMAC standings. 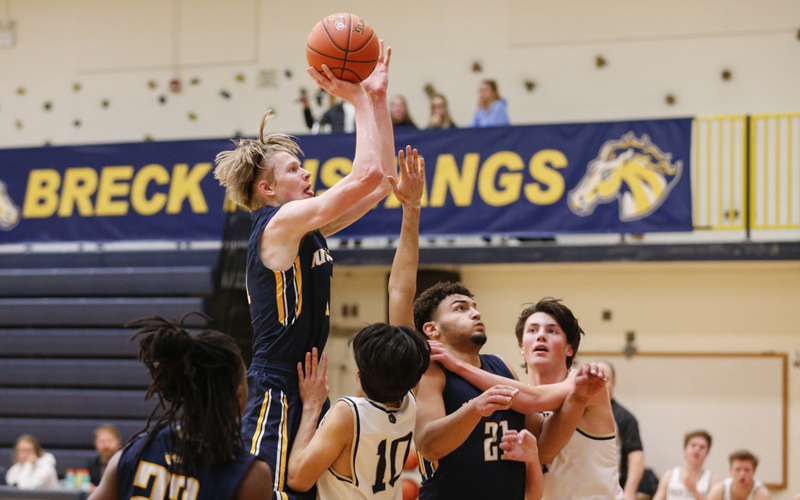 Breck took the top spot of the Independent Metro Athletic Conference standings with a 67-44 victory over Providence Academy on Tuesday at Breck School. Things started off a bit slow with fouls and tight defense. Providence Academy made its first points from the free-throw line and didn't get a basket until about seven minutes into the game. The lead was no more than four points for either side in the first half. The Lions (12-6, 5-2) went up by four with a couple minutes left in the first half on a three-pointer from senior guard Dylan Servais, The Mustangs, ranked No. 6 in Class 2A by Minnesota Basketball News, however, finished the half on a 8-1 run to hold a 24-21 halftime edge. Breck (16-3, 6-1) really opened things up in the second half and pulled away quickly with a 16-7 run, led by David Roddy who finished with a game-high 32 points. Teammates Jaren Morton and Joey Ganley added 13 and 12 points, respectively. Servais, who scored 17 points, was the only Lion to register double-digit points. With the win, the Mustangs evened their season series against Providence Academy, which beat Breck 56-47 on Jan. 18. Breck has won six straight and 12 of its last 13.